Learning the Nifty Thrifty Fifty* Is Easy! Older students need to learn to decode larger (polysyllabic) words. Since English is very complex, students need to learn a core vocabulary that will help them figure out what unfamiliar words in text mean. 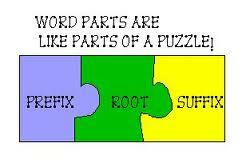 Our Nifty Thrifty Fifty store of words contain common roots, prefixes and suffixes. To help students learn a system for decoding and spelling big words, they will learn to read, spell and understand common spelling patterns of the following 50 words. Once students know the spelling patterns of these words, they can apply that knowledge to help them to spell and build meaning for many other words. Patricia Cunningham, author and respected educational lecturer, writes that for each Nifty Thrifty Fifty word a reader knows, she or he can read at least 7 more words. That means that by mastering the Nifty Thrifty Fifty words listed, students can use at least 350 additional words when reading and writing. Each month, we will focus on 8-10 Nifty Thrifty Fifty words. These will be posted in the classroom and used in our writing. We will look for examples in our reading. Students are encouraged to send in examples they find on their own to post on our bulletin board. For your information, the entire list is below. *Adapted from Month-by-Month PHONICS for Upper Grades, 1998, Patricia Cunningham and Dorothy Hall. Carson-Dellosa.